My grilled cheese for grown-ups is a modified version of the Ham-Taleggio Grilled Cheese recipe on the cover of the May 2010 issue of Food Network Magazine. 1) Melt 1 TBSP of butter over medium-low heat with olive oil. Add onions. Continue to cook onions over medium-low heat for 20 minutes, until caramelized. Stirring as needed so they do not stick or burn. 2) Butter one side of each slice of bread. Layer one slice of cheese, two slices of ham, slices of apple, caramelized onions, top with a second slice of cheese. Putting one slice of cheese on top and one on bottom seals the center ingredients in and makes for easier flipping. 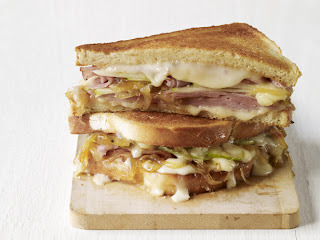 3) Cook each sandwich in the skillet over medium-low heat until golden brown. Flip and cook second side. Serve while hot. Enjoy! This will make 5 sandwiches. Sandwiches also can be refrigerated and reheated for 30-45 seconds in the microwave for leftovers. The sandwiches have a great combination of sweet, and tangy flavors. Really, really delicious, and my kids even eat the sandwiches too. This is crazy, just this morning the taste for grilled cheese with apples hit me. Seriously. I was thinking A smoked Cheddar, thinly sliced granny smith apples and thinly shaved black forest ham. lol. Oh man. I need to make this right now. I saw that issue and was wondering if it was any good--thanks for the review! Paula Deen makes a fantastic apple, bacon and cheddar sandwich that's to die for! YUM!!! Found your blog through a friend and have really enjoyed reading your blog. Look forward to reading more! woo hoo! Look at that sammich! skweeeee!! OK this looks yummy! I might be adding this to my menu plan this week. Thanks!